Hope seemed lost for those who bet the Sixers as home favorites Wednesday against the Celtics. A late Philly comeback had an improbable cover seeming like a possibility, but then Jayson Tatum did something very bad for those with 76ers tickets. 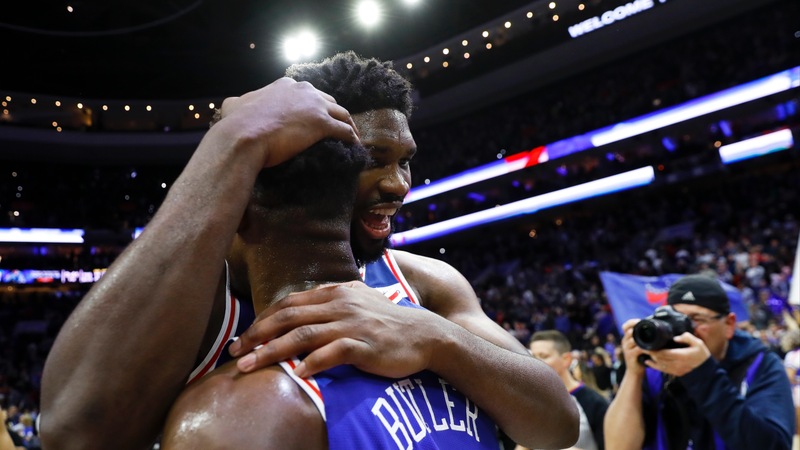 Philly's [118-115 win](https://www.thescore.com/nba/events/135667) Wednesday over the Celtics had playoff intensity, extraordinary performances ... and a bad beat for Sixers bettors. That's where we'll focus, because, well, we're a betting website and that's what we do. __MORE:__ [Nets historic comeback gives Kings bettors a bad beat](https://www.betchicago.com/nba-bad-beat-nets-huge-comeback-favored-kings) ## 76ers bad beat vs. Celtics Boston, which closed as either [a 3- or 3.5-point road underdog](https://www.betchicago.com/celtics-sixers-nba-betting-lines-odds-trends-march-20) depending on the book, was in desperation mode down five with 4.7 seconds left. Kyrie Irving hoisted up a fadeaway 3 that was an airball. But the shot was so off that Jayson Tatum (who appeared to toss James Ennis aside) was able to easily corral the rebound already in shooting position, and he dropped in an otherwise meaningless floater as time expired. <a href="https://youtu.be/fyakOtpxd2s?t=552" class="embedly-card" data-card-width="100%" data-card-controls="0">Embedded content: https://youtu.be/fyakOtpxd2s?t=552</a> Rough one for Philly bettors, but a good one for Philly fans, who had seen their Sixers lose (and fail to cover) their first three games against the Celtics this season. Joel Embiid, who [instigated Marcus Smart's third-quarter ejection](https://www.youtube.com/watch?v=0gM7gfe-B30), had 37 points, 22 rebounds and had [an incredible block on Irving](https://youtu.be/fyakOtpxd2s?t=518) with 31 seconds left and Philly up three. The 76ers went up five after Butler hit a jumper just inside the 3-point line with 4.7 seconds left. <a href="https://youtu.be/fyakOtpxd2s?t=527" class="embedly-card" data-card-width="100%" data-card-controls="0">Embedded content: https://youtu.be/fyakOtpxd2s?t=527</a> Philly trailed by as many as nine in the fourth quarter, but Butler, who scored 15 of his 22 points in the fourth quarter, hit 3-pointers on back-to-back Sixers possessions to cap a 15-6 spurt and tie the game at 105 with 5:05 left. The Sixers (47-25, 34-38 ATS) are in third place in the East, while Boston (43-29, 34-36-2 ATS) is fifth, so we could see these teams match up in the playoffs [for the second straight season](https://www.basketball-reference.com/playoffs/2018-nba-eastern-conference-semifinals-76ers-vs-celtics.html). __PLAY:__ Our free [Daily NBA Pick 5 game](https://betchicago.chalkline.com/games/nba-pick-5). Pick five select NBA games ATS to win a BetChicago prize pack.